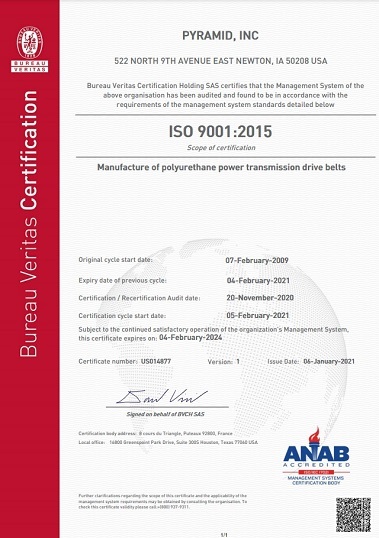 ISO 9001:2000 is an international standard of quality to which companies in many different industries aspire. The International Organization of Standards has laid out requirements that focus on making a consistent, high quality product. The ISO 9001:2000 standard in particular has an emphasis on customer satisfaction, as that is the true goal of all businesses. Without satisfied customers, a company cannot prosper. It is important to note that there is a great difference between ISO compliance and ISO certification. Any company can claim ISO compliance, even if they have no documented procedures whatsoever. Beware of companies who claim compliance but cannot back it up with certification. Only companies who can produce a registration certificate from a licensed registrar can say that they are truly an ISO certified company. Pyramid Inc. has been dedicated to quality products since its beginning in 1967. Our founder built our company on solid performance to his own unwavering standards and that dedication continues today. Our quality statement is, "Pyramid and its employees pledge to provide our customers with unquestionably high quality products and exceptional service." This dedication has been with us from the beginning and is the reason we have been so successful. One way we have demonstrated this commitment to being the best belt manufacturer in the industry is through our efforts toward achieving and maintaining ISO certification. Some of our customers had asked if we were ISO registered in the past, but it had seemed like a great deal of effort for a company which was already so strongly dedicated to quality. In 2002, Pyramid's top management decided the time had come to pursue ISO registration. With Pyramid's usual enthusiasm, we jumped into the process with both feet and achieved ISO certification on our first attempt which, we are told, is not common for small companies. In addition to being certified on our first attempt, we went from the planning stages to receiving our certification in less than seven months which is almost unheard of. Pyramid has developed a comprehensive Quality Management System (QMS) which covers all of the ISO requirements as well as going above and beyond. We have thorough job instructions for all of the production tasks performed at Pyramid from receiving our raw material to shipping the finished belts to our customers. We have a formal corrective action system to take care of problems that arise and a preventive action system to try to catch them before they develop. We have logs where we record customer feedback and internal issues so they can be reviewed for trends and adjustments to our procedures can be made as necessary. One of the reasons to have a QMS in the first place is to improve the processes and products of a business. But once that system is in place, if the system remains the same, it can become stagnant and not adapt to the ever-changing business environment. We at Pyramid Inc. have two major tools at our disposal for the continuing review and improvement of our processes and products. First, we have a comprehensive internal assessment program under which certain aspects of the QMS are examined every month by our team of internal assessors. These individuals are from different functional areas of our company and rotate through examining the various areas of the QMS. The result is that each time a process is reviewed, there is a different perspective brought to the assessment. This process ensures not only that our QMS is followed as written but also that it continues to improve over time. The other major tool we utilize for continual improvement is our management review meetings. These quarterly meetings are held as a high-level review of the system and include all of Pyramid's management, techincal and sales staff. This is our chance to closely examine our QMS as a team to find ways of improving the overall system. Management review is also our opportunity for a overview analysis of our collected data. We perform a detailed analysis on this data during our bi-weekly staff meetings, but at management review, we look at the entire last quarter and also compare that data with previous quarters to ensure that we are moving in the right direction. Bureau Veritas Certification is the company who performed our registration assessment and examines Pyramid's QMS on an ongoing basis to ensure that it continues to meet the ISO standard. The registration period is on a three year cycle, beginning with the registration assessment. A Bureau Veritas Certification representative comes to Pyramid every six months after the registration assessment to ensure that the QMS is maintained to the ISO standard. This process continues until the end of the three year cycle and then begins again. Bureau Veritas Certification certifies our management system and does not certify any products manufactured by Pyramid. Bureau Veritas Certification is one of the leaders in the business of ISO registrars and we are proud to have them as a partner in our continuing efforts. Questions About Pyramid's ISO Program? If you have any questions about our QMS, please contact Shaun Fortune. He is our Management Representative and can answer any questions you may have about our system.